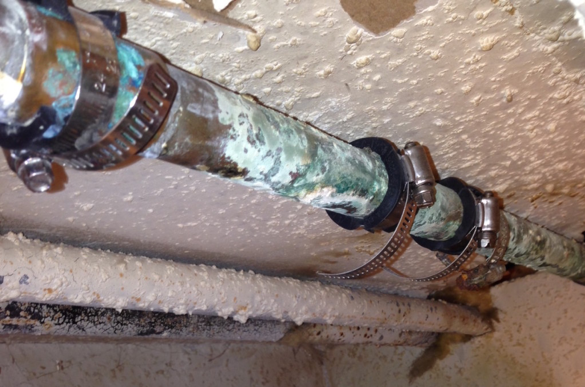 It is common for property maintenance staff to clamped pinhole leaks as a temporary solution to stop leaky pipes. SageWater Renew provides a non-invasive solution to address pinhole leaks and pipe corrosion in copper and galvanized steel domestic pipes. Suitable for most multifamily residential and commercial buildings, SageWater Renew is safe and environmentally friendly. We start by testing the water to determine its composition and the optimal mix and concentration of corrosion inhibitors needed for each individual building. We then design and install a system to feed our proprietary, tasteless, odorless, FDA/EPA/AWWA approved and NSF certified additive into the building’s main water supply system. This additive forms a thin protective film on the inside of the pipes, preventing additional corrosion and stopping pinhole leaks from forming. The film does not clog your pipes, repairs itself if damaged, and prevents further pinhole leaks and pipe corrosion as long as the additive is precisely maintained. After the protective film is fully formed—Renew monitors, maintains and tests the treatment system on an ongoing basis to ensure the property is protected. To be clear, Renew is not like Epoxy lining, which coats the inside of your pipes with an epoxy resin. Renew treats your water at the water chemistry level, much like a water softening system, to provide protection from corrosion and help prevent pinhole leaks. For more on the innovations behind renew, check out the “How it Works” section.